A home office can be a savior of productivity, but it can also quickly become cluttered and disorganized. Especially if your office shares space with another living area, it can sometimes seem like trying to stay organized is an exercise in futility. 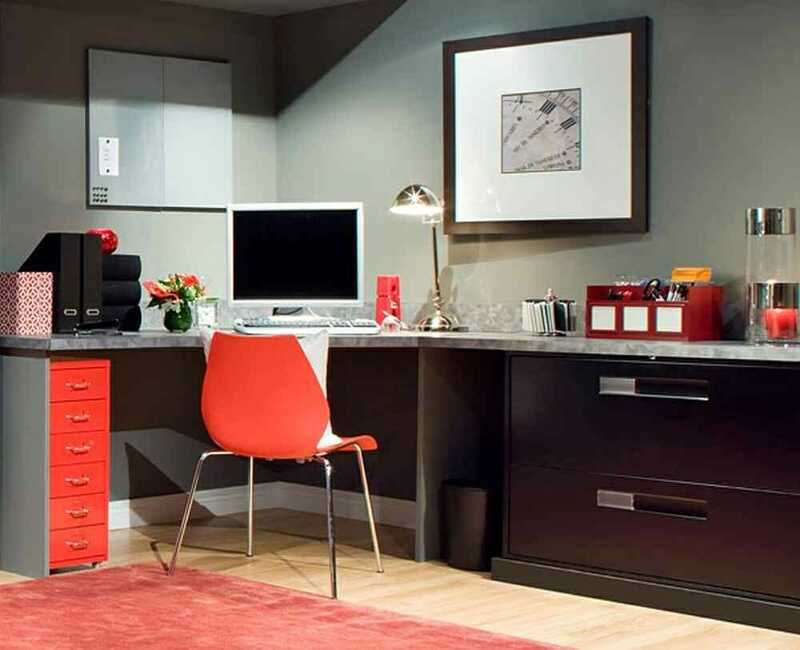 However, keeping your home office clutter-free is no only possible, it’s relatively easy. Here are some tips for filtering through the clutter and keeping your home office space organized so you can stay productive and on top of your tasks. Things like folders, paper clips, binder clips, and other fasteners can be a great way to prevent loose papers from being scattered all over your desk, falling to the floor, and becoming out of order. It might seem obvious, but surprisingly few people actually use these office essentials. Developing a routine for all your paperwork and making a place for it means that it doesn’t have to continue piling up on your desk, which is how things get lost, misplaced, and forgotten about. You’ve seen those metal or wire stands on desks where people can put folders and papers into slots, store overflow pens and paperclips, and keep track of their mail. These straightforward organizers are inexpensive and can make a huge difference in the organization of your desk. Instead of trying to keep things separated into piles, you can put things into separate slots and since they’re standing instead of lying flat, you’re better able to comb through to find what you’re looking for. The fact that they’re standing also means the contents are more visible, so putting important paperwork into a desk organizer won’t mean forgetting about it altogether. Using a hierarchy system where you keep the most important things on one side and they become less urgent as they get closer to the other will help keep things from slipping through the cracks. This tip is more about a system of organization, but it’s time-tested and has worked for countless entrepreneurs the world over. Using a color-coded filing system can add another layer of organization on top of labeling and will help you to keep important paperwork and documents where they should be. For example, you could file your medical records in blue folders, important emails in orange folders, financial records in green folders, and so on. There’s a reason why organization aficionados have an ongoing love affair with the label maker: They’re incredibly handy. Use one to label drawers, boxes, containers, folders, or anything else. It’ll make it easier to navigate your office without rummaging through boxes and drawers, plus they’re way more fun than writing out labels by hand. Shelves don’t get the credit they deserve. They can go on any open wall, come in a variety of depths and forms, and can hold just about anything. Open wall space in your home office is a great opportunity for shelves. You can store books, binders, baskets of various contents, knickknacks, seasonal decorations, and whatever else your heart desires. And perhaps the best part is that as long as they’re organized and not over-stuffed, they can even look great and be a prominent design feature of your office. Do you have any awesome home office tips we missed?